It had been a long tiring intensive recording session (in Paris) to capture Corentin Boissier's "Sonata Appassionata". After the 'official takes' were finished - Mike asked me for a complete run through - just for the video camera. Sometimes Mike messes up !! - here's "Out Take #1" !! My latest CD is out!! Big Thank You goes to everyone involved and supporting this fantastic project. Music Exam and Grade results coming in thick and fast at the moment ! It's a fantastically well done to my student Kendra on achieving a maximum 30 out of 30 for the Performance element of her GCSE Music exam. Brilliant ! 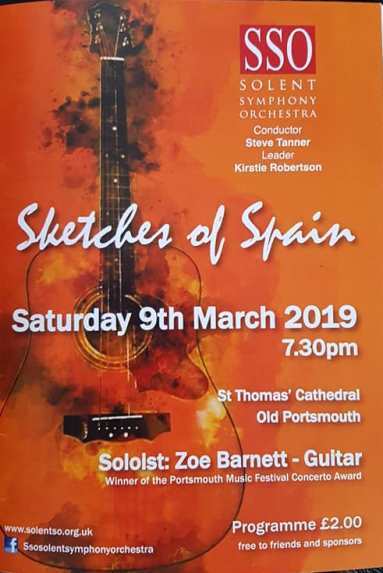 Proud teacher and Diploma student George, after last night's concert with the Solent Symphony Orchestra in Portsmouth and their "Sketches of Spain" program ! Some snippets of my recording Corentin Boissier's 'Glamour Concerto' with the Ukrainian Festival Orchestra, Conductor & Grammy Award winner John McLaughlin Williams, in Lviv, Ukraine at the end of February/beginning of March. Whilst I was away in the Ukraine, Edward Chyczewski reminded me that 1st of March was the anniversary of the birth of Frederick Chopin (209 years ago) So here to commemorate is a public performance I gave in 2012 of one of his most famous pieces - Fantaisie in F minor op 49. This afternoon (20th February), my student, Jimmy Alderson, achieved Honours (92 !) in taking The Recital Class of Portsmouth Music Festival. 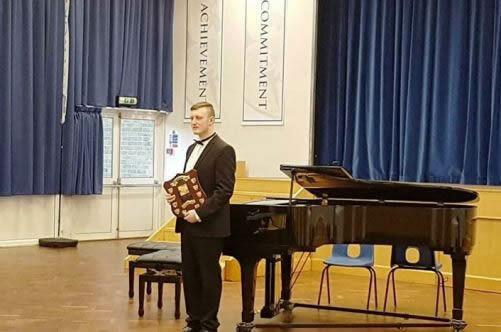 He was also awarded The Clifford Benson Piano Prize for outstanding musicianship and communication. Well done, Jimmy! Sooooooo proud of you! Congratulations to my piano student Liam on achieving his ATCL Diploma! He is now officially an Associate of Trinity College, London ! I am the Piano lecturer/music performance teacher/instructor at Havant & South Downs College's award winning Music Department. 2 weeks ago I took part in a 'Show Case' Open Evening event for current and prospective students and their parents/carers in our unmatched purpose built Recital Hall facility. 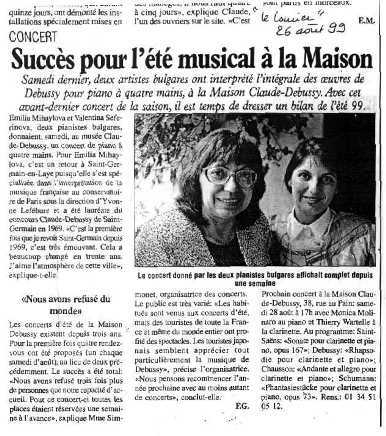 Just come across these French Newspaper cuttings of 20 years ago about myself and colleague Prof. Emilia Mihaylova - now sadly departed. 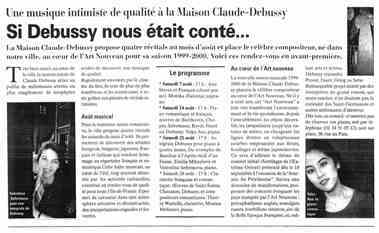 And our appearance & performance at Claude Debussy House & Museum, St. Germain-en-Laye, Paris, in 1999 on the anniversary of his birth - a rare honour to be invited for this annual anniversary concert. Will be making a professional re-visit to Paris - probably in April this year. Yup - that's me bottom left in the first one ; and to the right in the second !! Spent the afternoon in a 3-way Skype rehearsal with myself here in Hampshire, the French composer Corentin Boissier (on the right of the lap-top screen) in Paris, and the Grammy Award winning conductor John McLaughlin Williams (on the left) in the USA. !! We're scheduled to meet in person in 7 weeks time in The Ukraine - but spent the time agreeing certain details of performing the 2 concertos before recording them for the very first time with Orchestra. Heidi the dog took it all in her stride !! It's going to be a very busy year - but am very much looking forward to it !! 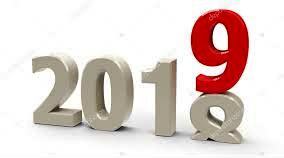 As we approach the last few days and hours of 2018 - may I wish everybody the very best of times in 2019. I know some may feel this to be a bit early - but am so busy in the lead up to Christmas that I hope you don't mind ..
You may remember (or not - as the case maybe !!) that myself and one of my students took part in Solent Symphony Orchestra's performance at St. Thomas's Anglican Cathedral in early October of Saint-Saëns' - Symphony No. 3 (Organ Symphony) with David Price: organ. I see that this performance by the Orchestra has been nominated by the Portsmouth News 'Guide' in the 'Best Classical' category of their annual end-of-year awards! Voting is open soon - keep an eye on it. And 'Sssssshhhhhhh' - keep it to yourself - but I have been approached about the possibility of a special 'reprise' concert of the Saint-Saëns sometime next Year ! Watch this space ! Sssshhhhh ! It was with considerable pleasure that I attended a concert at Sidholme Music Room on Sunday 25th November. 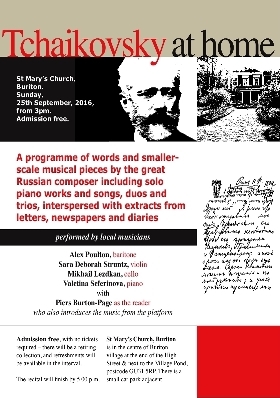 ‘A treasury of song and solo piano’ was presented by Alec Poulton – baritone and Valentina Seferinvoa – piano by invitation of the Friends of Sidholme. A capacity audience enjoyed a most imaginatively constructed programme reflecting compositions conceived in or around the First World War. 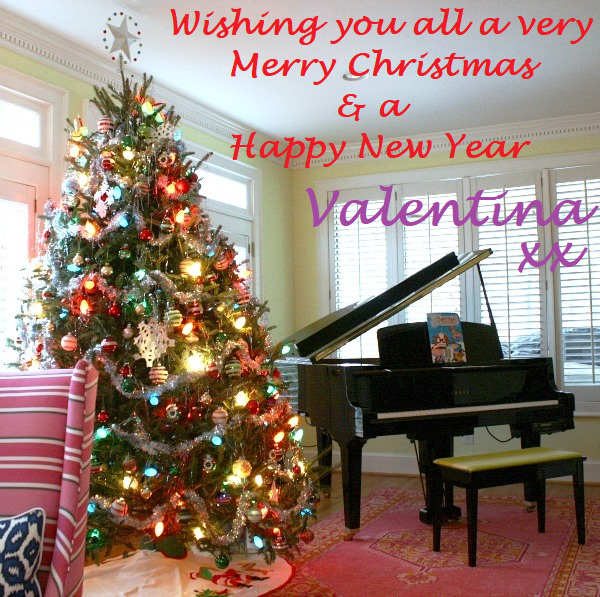 Singing with absolutely assuredness and beautiful tone, Alec was exquisitely accompanied by Valentina. This was truly an exceptional concert delivered to a high professional standard which enthralled the audience throughout. The young trumpeter Hetty Christopher also contributed brilliantly to the programme playing with mature, well-rounded tone. There were numerous highlights including rarely heard short songs by Fararr and Somervell, as well as more familiar ones by Vaughan Williams (‘Linden Lea’) and George Butterworth (‘The lads in their hundreds’ and ‘Is my team ploughing?’). These were interspersed with some beautifully delivered Tchaikovsky songs as well as ‘Troika’ from the composer’s suite ‘The Seasons’ for solo piano which was particularly enchanting. The inclusion of some delightful French thematic material brought a wonderful contrast to the programme which the artists presented effortlessly with great character and fine articulation. Valentina’s presentation of Debussy’s ‘Claire de Lune’ was magically delivered with eloquent phraseology and well-chosen dynamics. There was silent reflection after the Butterworth with the addition of some perfect off-stage solo trumpet calls before the concert continued with two lighter Novello renditions. The prolonged and enthusiastic applause by the audience brought this concert to a fitting conclusion. It's a HUGE congratulations to two of my more junior (in age!) students !! One achieved a Merit in his recent ABRSM exam; whilst the other achieved a Distinction. A very well done to both. Just announced - Coming Soon ! at St. Thomas's Anglican Cathedral, Old Portsmouth. and is in addition to a performance of same with the Brunel Sinfonia in Bristol on 6th July 2019. Sunday 25th., 2018 - afternoon concert in Sidmouth, Devon. 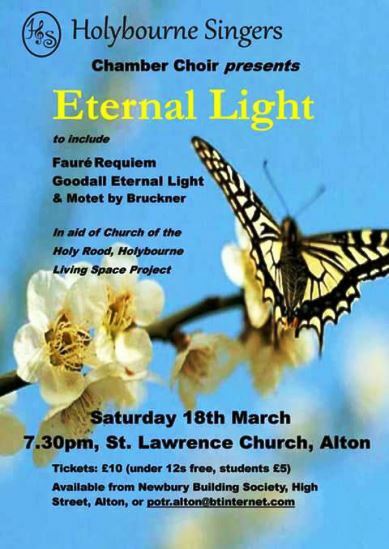 An interesting joint Rememberance themed recital with Baritone Alex Poulton. 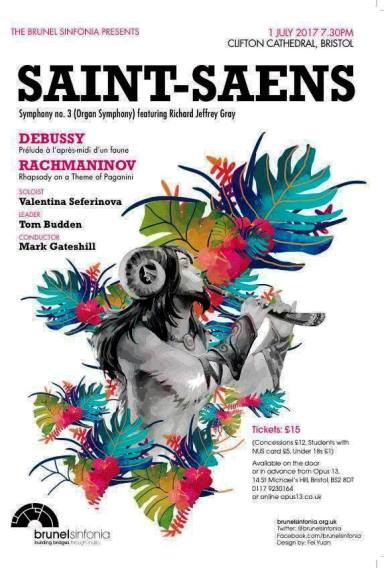 I, together with one of my students George, will be taking the 4 hand piano part in the Saint-Saëns classic ! Yes it's that one - "That'll do pig; that'll do". Spent the morning (Tuesday - 4th) in a Staff Meeting at Churcher's College in preparation for new academic year. Can now reveal how my students did across the board !! Havant & South Downs College - 'A' levels - all 'A's and 'B's !! Churcher's GCSEs - all '9's - under the new marking criteria (A**) !! And it's a HUGE congratulations to one of my former students - who's gone on to achieve his Masters degree in performance. Fantastically well done Jeremy ! With my new recording contract as my main focus for the coming months; and with 3 solo orchestral engagements in the next 12 months ; on top of any other late engagements I've had to take a close look and review of my other commitments - including reviewing and pruning my private teaching practice somewhat to free up time for my own practice/rehearsal time. Some tough decisions have had to be made! But the outcome seems all well ! With a relaxing and celebratory drink in hand I'm reminded of Bacchus - the Roman God of the vine, grape harvest, wine-making, and, of course, wine itself !!! Arrived back in UK from hols on Monday the 20th.! It's still 10 days/2 weeks before I get fully back into the swing of things at the beginning of September ; but I did spend some time whilst away working on new pieces by Corentin Boissier which, now the contract is formalised and agreed, will be my focus of attention for the next 6 or 7 months. They are Concertante pieces and scheduled to be recorded in the Ukraine next February/March under the baton of American Grammy Award winning conductor John McLaughlin Williams. There are to be follow-on dates, as yet to be agreed, for the recording in Paris of a solo piece by the same composer to complete the projected CD. My husband has just updated my website 'Repertoire' lists. 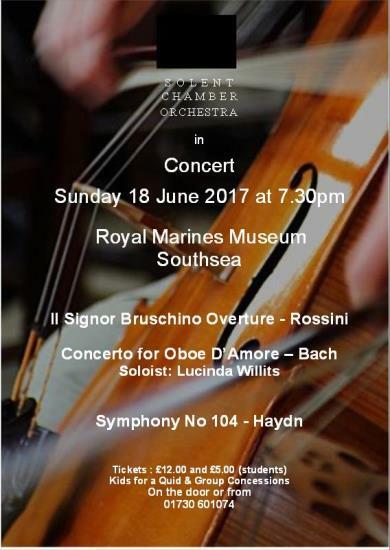 This is a repeat of the program performed on Sunday 7th June at the Royal Marines Museum, Southsea - of which a reviewer commented :- "This was a summer concert not to be missed ........"
See Solent Symphony Orchesta website for full details and ticket information. I'm pleased to announce that I've agreed to take part in 2 forthcoming performances of the Solent Symphony Orchestra. Sunday 17th June at the Royal Marines Museum at Southsea; and a repeat of the complete program on Saturday 14th July at St. Peter's, Petersfield. See my Engagements page for fuller details. I am in Warsaw, Poland until the 6th June; in the recording studios of leading Polish Recording Company Acte Préalable. 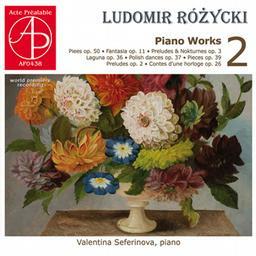 The project is to record a second full CD of pieces by the rediscovered Polish composer Lubomir Róźycki as a follow up of the previously successful "Lubomir Róźycki - Piano Works 1"
For more information on Lubomir Róźycki - go Wikipedia. Very excited to be invited by Petersfield Town Council to perform for the re-opening of the Petersfield Town Visitor Centre tomorrow (23rd June). Even better, looking forward to performing on a superb Steinway my Lubomir Róźycki programme (which I'm recording at the beginning June in Recording Studios of the Polish national Radio in Warsaw)! It has been 70 to almost 100 years since these music pieces were last performed!! I'm pleased to announce a (very!) 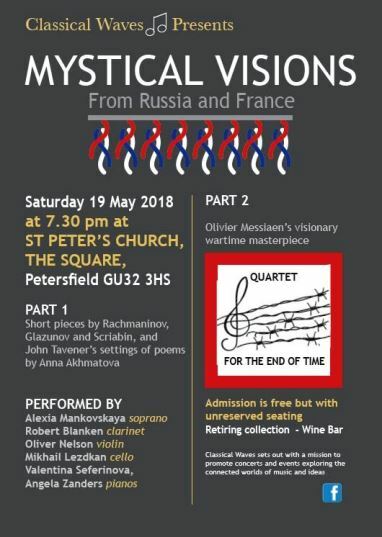 short notice Sunday afternoon Concert in Petersfield - where I've been asked to join colleague Mikhail Lezdkhan ('Cello) and other friends. Rachmaninov's 'Trio élégiaque No. 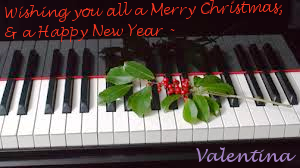 1 in G-minor' (myself on piano; and Violin, and Cello. Admission - Free with a Retiring Collection. I'm more than happy to lend my support to this entrepreneurial fundraising event on behalf of one of my junior students. A range of music by Mendelssohn, Chopin, and others. Admission Free : Retiring Collection. Why not take afternoon tea accompanied by some music ! 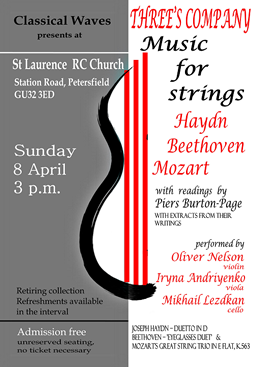 Although I'm not taking part - I can thoroughly recommend this for next Sunday afternoon, 8th April, in Petersfield. Heading to recording studios of Acte Préalable ; again !!! To record my 12th CD !! But huge congratulations to Alex on achieving this first level of professional qualification ; enables him to legally describe himself in his passport as 'Musician', and have the letters 'Dip.ABRSM' after his name !! Quite a lot of work associated with the Portsmouth Music Festival in accompaniements, and students taking part. I will also be involved with their Gala Concert at 3:00pm at Park Community School, Middle Park Way, Havant PO9 4BU on Sunday 25th March. Continuing my rehearsals for 'Róźycki 2' CD ! For the most part of this Winter I'll be keeping my performance diary clear as I use my spare time to prepare for another visit, this comingSpring, to the recording studios of Acte Préalable in Warsaw. This will be my 12th CD !! But please check back from time to time in case I'm undertaking a short notice event. all Actors who can sing. 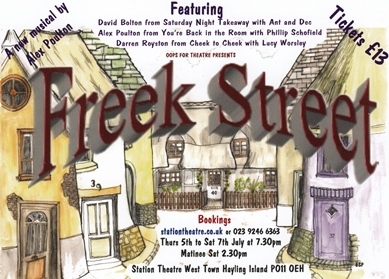 To be involved with an amateur non-profit local community Musical Theatre/Operatic Project I’ve associated myself with. At the moment any profits made to be for the benefit of ‘MIND’. 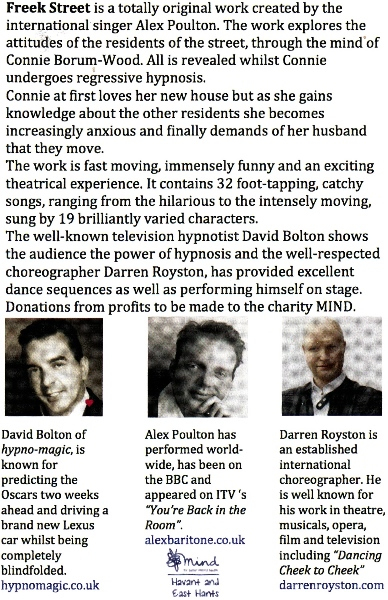 For 4 or 5 days performance (including rehearsals) at Hayling Island Dramatic Society (HIADS) early July of a new work written by Alex Poulton (Baritone). 4 new short videos up loaded to YouTube. From the archives of Bulgarian Cable TV channel - videos of a concert on 29th October 2009 in The Recital Hall of my Academy held as a memorial to my Professor Dr. Lubomir Dinolov for his 75 years. Each one is a 4 hands transposition of Mozart's works by Prof. Dr. Lubomit Dinolov ! Each features the late Prof. Emilia Mihaylova & myself. Duettino (Don Giovanni, Zerlina) - from Mozart's opera "Don Giovanni"
Ariette (Cherubino) - from Mozart's opera "Marriage of Figaro"
Aria (Figaro) - from Mozart's opera "The Marriage of Figaro"
For the most part of this Winter I'll be keeping my performance diary clear as I use my spare time to prepare for another visit, next Spring, to the recording studios of Acte Préalable in Warsaw. 'The Guide' magazine of the Portsmouth 'News' has announced their 2017 award nominations for a variety of local entertainment categories. In the 'Best Classical' section I have been nominated (entry no. 9) jointly with Petersfield Orchestra for their last June's 90th Anniversary concert. I was also involved as pianist for entry no. 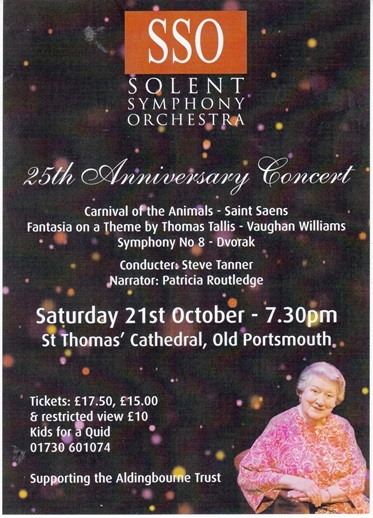 3 - the Solent Symphony's 25th Anniversary concert in October. You can vote at https://docs.google.com/forms/d/1f51Vm-zcP-AY2j72MBC1zavRRGtULX0zLftvu6TGt5s/edit. For the most part of this Autumn and Winter I'll be keeping my performance diary clear as I use my spare time to prepare for another visit next Spring to the recording studios of Acte Préalable in Warsaw. Announcing my first engagement of the new 2017-2018 Season. Charity based in Sussex which supports people with learning disabilities to reach their potential. September beckons a return to teaching and a new performance season! Whilst on hols back in Bulgaria came across this from 1998 in the archives of Bulgarian National Television - myself and the late and greatly missed Prof. Emilia Mihaylova performing pieces of Claude Debussy's 4 hand works "Integrale". See what you might recognise (apart from a relatively new wedding ring !!! ). Unfortunately the Directors instructions seems to be on the sound track too at times - but I hope you enjoy. Brunel Sinfonia, it brings to a close my performance season of 2016-'17. Watch this spaqce for new announcements for next season. Bach's 'Concerto in A major for Oboe d'Amore'. See poster to the right for other items in the programme. 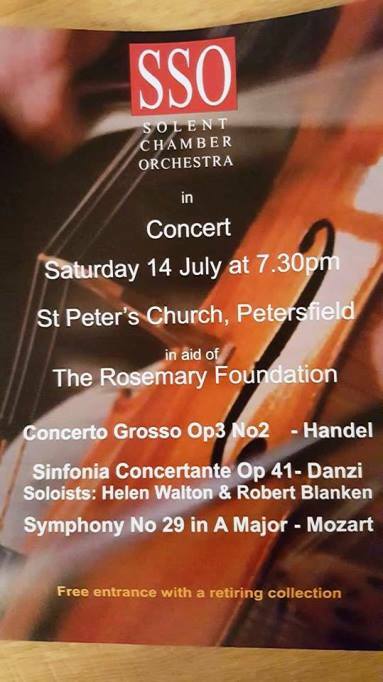 Apparently Petersfield Orchestra 15th June is 'Sold Out'! Only chance would be 'Returns' : try telephone 01730 268829. Alternatively - if you're near Bristol, or have family/friends, or willing to travel see below for 1st July in Clifton, Bristol with the Brunel Sinfonia. 3 rows at the front on the flat - £16. followed in the evening by first rehearsal with full orchestra. Spontaneous applause from all involved at the break and at the end of the session !
" ...It was 20 years ago today ... "
- well not quite Sgt. Pepper !!! First meeting yesterday afternoon (31st March) with conductor Nicholas Bromilow to discuss all 24 variations in Rachmaninov's 'Rhapsody on a Theme of Paganini'. And - "Yes" - Number 18 was discussed !! 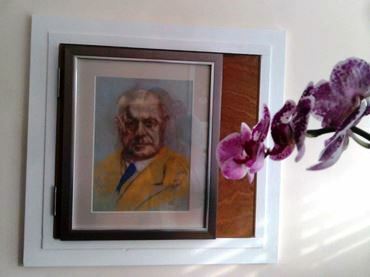 Some few years ago one of my senior students gave me an original chalk drawing/sketch of a copy of a widely known picture of the Finnish composer Jean Sibelius (1865-1957). At last I've got around to having it mounted and framed : here it is in my Music Room at home. 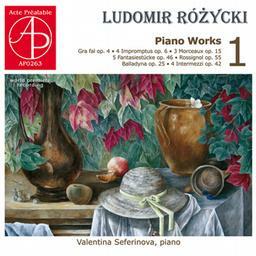 Your Rozycki CD is absolutely superb! 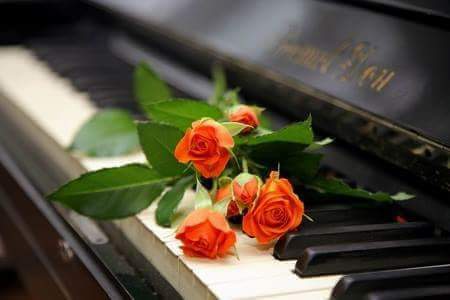 You are a wonderfully gifted pianist. (name left blank here to protect his privacy)"
Ignore the financial aspects - it's unsolicited comments like this that make it all worthwhile ! 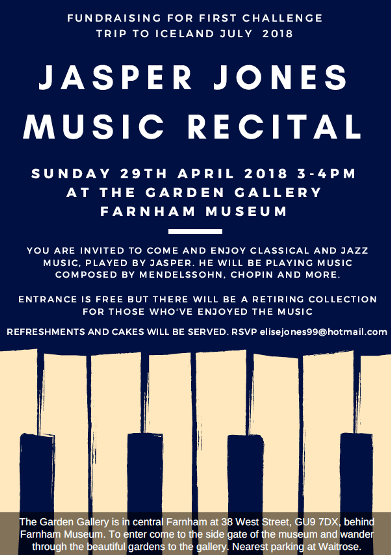 All but finalised our 2 piano programme (one more Vladigeuroff piece to be agreed) with colleague Peter Rhodes for Saturday 27th May performance. As routine begins to return to normal in this New Year I’ve already begun to work up Sergei Rachmaninov’s “ Rhapsody on a Theme of Paganini” : Opus 43 to be precise; there’s to be 3 performances of this most famous of pieces later on in Spring and early Summer. 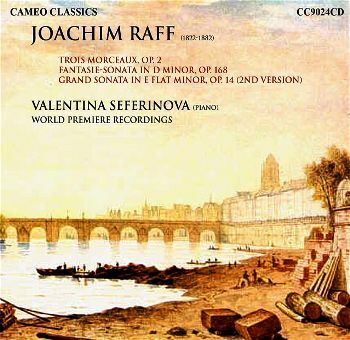 It consists of 24 variations played consecutively as a piano concerto; with full orchestra. From the immediately recognisable iconic opening bars of variation number one, others, too, are familiar to many without even realising where the music comes from. The most famous of all is variation number 18 – widely regarded as one of the most beautiful pieces of music ever written. It was also used in the 1980 film “Somewhere in Time” (with Christopher Reeves and Jane Seymour). try this - let it (variation 18) develop (with glass of wine in hand !) - if this doesn't touch you then you're not likely to be breathing !- https://youtu.be/h4N1mxN5JbU - in this clip it segues into a John Barry guitar based theme. You might say a variation on a variation !! Tip : Listen/Focus on the music; the video is of secondary importance. But – WARNING ! WARNING ! WARNING ! – tickets will only be sold to those who can handle this level of emotional intensity ! Girls – drag your fella along ; Fellas treat your lady to a romantic Night Out with a difference. Also to those who thought, or continue to think the ‘Romantic Era’ began with Adam & the Ants and Boy George – think again : It actually and officially covers the period from the mid-1850s until the present day !! - Rachmaninov himself was born 1873 and died 1942. His Rhapsody dates from as late as 1934. See translation on the right. 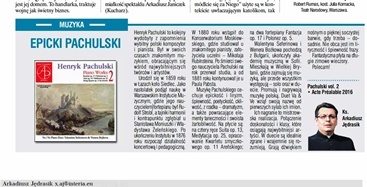 "Henry Pachulski is another eminent Polish composer and pianist rescued from oblivion. He was in his time an accomplished musician, mixing amongst the greatest creators and artists. He was born in 1859 in Lazach, Siedlec.As a teenager, he began studying at the Warsaw Institute of Music, where his piano teacher was Rudolph Strobl, and the secrets of harmony and counterpoint were studied with Stanislas Moniuszko and Wladystawa Żeleński. After graduating from the Institute in 1876 he started his concert and teaching career. In 1880, he entered the Moscow Conservatory, where he studied with the excellent pianist, and founder of the university - Nicholas Rubinstein. After the death of his teacher Pachulski had a year of year of interrupted studies, but in 1881 continued them with Paul Pabst. 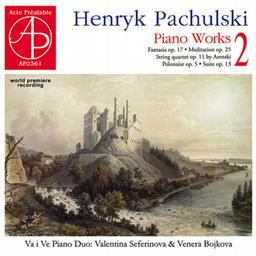 Pachulski's music is characterised by epic style and lyricism, melodiousness, verses, slush, rarely - drama, as well as the returning elements of dance and specific playfulness. On the disc are four hands Suite Op. 13, Meditation Op. 25, the development of the String Quartet op.11 Arensky; Fantasy for Two Pianos Op. 17 and Polonaise Op.5. Valentina Seferinova and Venera Bojkova are from Bulgaria and finished at the Music Academy in Sofia. They both live seperately in the UK, playing solo and performing duets. They play, record, and promote Polish music. The name 'Va i Ve' comes from the first syllables of their names. Their performances combine class and precision of great artistes. Their record is a masterly realisation. The combination of excellence and quality, which can reach the most prominent artists. The duo are perfectly timed and in understand each other perfectly. Their distinct sound is both expressive and clear, filled with energy. They are no strangers to lyrical and melodious phrases. The record is perfect for a long winter evening. I look forward to seeing you all again in 2017 ! I'm pleased to announce, that in addition to performing Rachmaninov's "Rhapsody on a Theme of Paganini"
I've now also been invited to play the same as Guest Soloist with the Brunel Sinfonia, Bristol at Clifton Cathedral on 1st July 2017.
my Thesis for my Master's Degree is/was entitled ‘Nature of intonation and texture of the piano works of S V Rachmaninov’ !!! Just come across an on-line review of my recent Bristol Music Club appearance ! Not sure whether I can add to, or comment on, it ! Yay ! My latest CD is now available world wide ! Recorded earlier this year in Warsaw. My fourth one for this company ! Rehearsing and looking forward to two November performances of Dubussy, and Satie in Bristol and Portsmouth ! St Mary’s Church, Buriton. Sunday, 25th September, 2016, from 3pm. You may remember the viral Ice Bucket Challenge of a couple of years ago in aid of ALS/Motor Neurone Disease research. It seems all the money raised by it has led to a breakthrough. It has been discovered that its the NEK1 gene, which contributes to the kind of MND which is passed on in families. Just for fun - and my embarrassment, here is the video of my original Ice Bucket Challenge - no thanks to my husband for reminding everybody of it !! 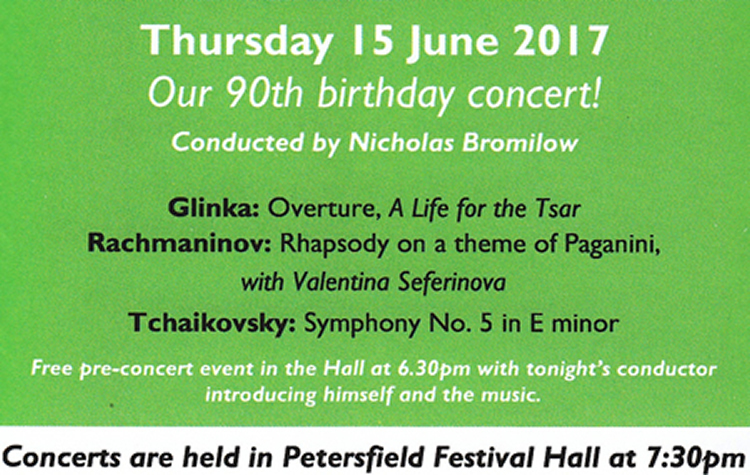 I feel honoured and privileged to be invited back again as Guest Soloist for Petersfield Orchestra's significant 90th Birthday Concert next June. Achieving his Grade 3 ABRSM as his first Grade exam ! 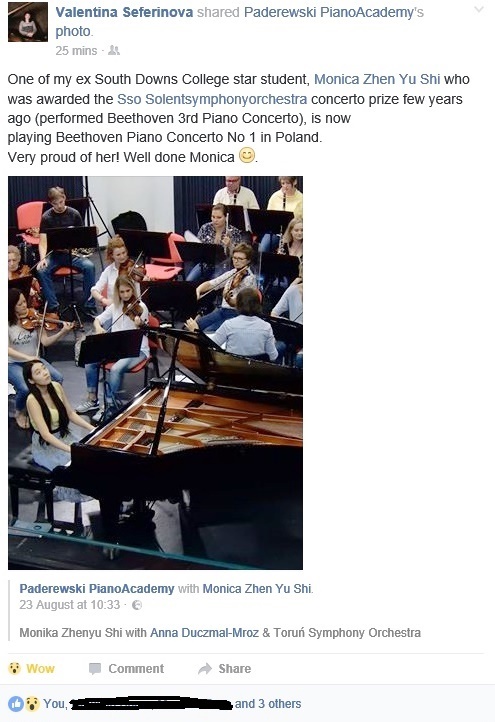 For some years I've had the privilege of being a Steinway & Sons™ (based in New York) listed Music & Piano Teacher; Steinway have also provided performance sponsorship.for me here in the UK in the past. They have recently undertaken quite an overhaul of their Teacher Directory for those lucky enough to be included. Here's how my entry now looks ! I'm impressed. The recording I did in Warsaw with my piano duet partner Venera Bojkova, as the Piano Duo 'Va i Ve', back in April, is coming out soon! Just received the first set of edits together with the link to the listing of the CD on the record label's website. It's my 4th CD with and for 'Acte Prealable' - and my 10th overall. That Rhapsody is feeling closer to happening !! Can you guess ? Here's a clue ! Although some 14 months away I feel a Rhapsody coming on ...... ??? All done! :) Today saw us finish the 4 hand pieces. So a total of 80 minutes of music recorded in about 9 hours of studio time! This is unusually quick. Jan, the Acte Préalable recording company boss, impressed (and pleased ! ); but greatly helped today by a knowledgeable recording engineer - so a bottle of wine from us to him for his efforts. So a high speed TGV train to historic Krakow tomorrow for a few days. Have flown out to Warsaw; will spend 2 or 3 days there - mostly in a recording studio with my 'Va i Ve' piano duet partner Venera Bojkova. Then will take a train to Krakow and stay for a few days before returning to Warsaw and a flight return to UK. Should be great fun ! Well, it's the final 2 days of rehearsals before traveling again to Warsaw to record in the Studios of the Polish National Radio an all 2 pianos/4 hands CD of Henry Pachulski' works, with best friend (and of course 'Va i Ve' piano duet partner) Venera Bojkova. The resultant CD will be issued on the Acte Préalable label. Another big event done last night - the Gala of Portsmouth Music Festival at the Kings Theatre. It was wonderful to be involved, to be part of the community, helping the youngsters finding their path in the art of performing on the big stage. Tomorrow - 12 A2 recitals, followed by another 8 AS recitals at South Downs College on Wednesday. Looking forward to Thursday when I can immerse in my final preparation for the recordings in Warsaw next month. 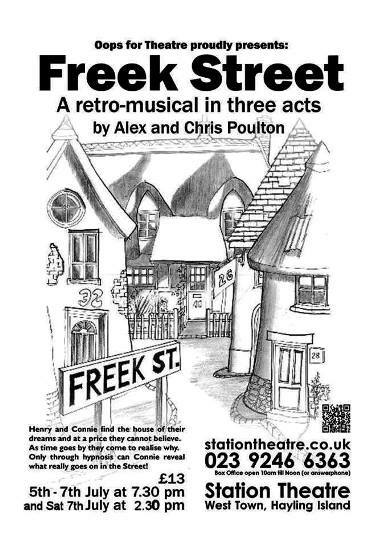 from 7:00pm on Sunday 20th March at The Kings Theatre Southsea. Well done Fliss ; Congratulations on taking 2 of the 3 Cups on offer today "
Just noticed from this year's The Portsmouth Music Festival programme and website, that for the second year running my name has been included as one of the 'approved accompanists' for all participants ! My first one is this afternoon and evening. in preparation for our studio recording session for Acte Prealable in Warsaw in early April.
" Дорогие мои русские друзья! Боже мой! Какой прекрасный вечер! Те артисты были просто чудными. Как я любил, как они играли. Я был в восторге. 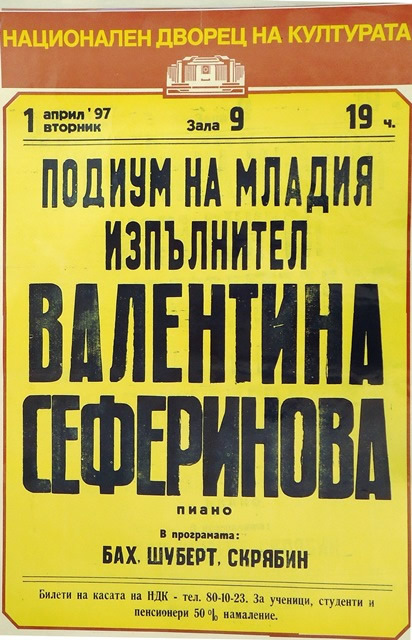 И вечеринка потом - просто рай на земле. .............. "
" My dear Russian friends! Oh my God! What a wonderful evening! Those artists were simply marvelous. How I loved the way they played. I was delighted. And then the party - a paradise on earth. ................ "
please note that the Music School is in a different location to the College itself. Although there is a free car park (entance around the corner in Romans' Road) I believe there is ample on-road parking near by. The organisers have also asked me to point out that the event starts at the earlier time of 7:00pm. ; and that early arrival is needed because any one arriving late will not get in through the secure door - as evrybody will be in the auditorium ! Just completed a joint engagement with 'Cellist Mikhail Lezdkan in Chichester Cathedral. Stewards report "500+ audience" in the Cathedral. Out to dinner last night with hubby; this guy comes over and says "Hi. I've downloaded 1 of your CDs from ITunes ". Then shows me all of the tracks from my Raff CD downloaded on to his 'phone. It's an amazingly small world ! 1. Allegro non troppo. 2. Allegro.